The Oregonian's website has published my list of recommended performances for this summer. You can access the article here.The printed version will appear this weekend. On this day in 1723,Bach's first cantata performance in Leipzig (Cantata No. 75, "Die Elenden sollen essen") was presented at St. Nicolai Church, the day before his official induction as Cantor in that city. 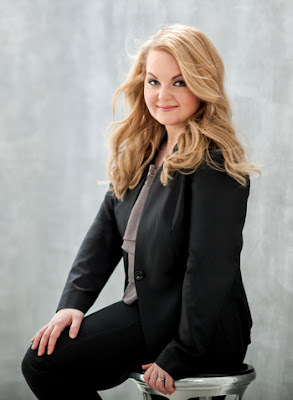 Metropolitan Opera superstar Angela Meade returns to Astoria for her Oregon Debut Recital make her Oregon debut recital accompanied by highly acclaimed pianist Danielle Orlando. Prog ram includes art songs and arias by Handel, Liszt, Bellini, Verdi, and Strauss. Ms. Meade joins us after a whirlwind spring and winter of Mozart’s Don Giovanni at the Metropolitan Opera (New York), Verdi (Bilbao, Spain), and Donizetti (Sevilla, Spain). GRACEFUL BAROQUE BY CANDLELIGHT Concert #1: SOUND THE TRUMPET! An evening of magical Baroque music. Acclaimed Baroque trumpeter Kris Kwapis and soprano Arwen Myers join the Festival period instrument ensemble for Purcell’s Sound the Trumpet and music from King Arthur, featuring Noah Strick and Hannah Leland, Baroque Violins, Adaiha MacAdam-Somer, Baroque Cello and Julia Brown, harpsichord. Concert is at Astoria's gorgeous historic landmark Grace Episcopal Church. Back by popular demand, Oregon’s hip band brings their special blend of fun and flair in an eclectic night of Tango, Klezmer, Latin, and Roma (Gypsy) music. Equal parts ravishing melodies and toe-tapping rhythms played on violin, accordion, percussion, and cello. Special guest vocalist Minntah Haefker, Astoria’s own 12 year-old singing sensation. Pianist and Director of Chamber Music, Cary Lewis leads a exquisite evening featuring Ukrainian violinist Solomiya Ivakhiv, prizewinning cellist Sergey Antonov, with prizewinning pianist Ilya Kazantsev, and Metropolitan Opera soprano Deborah Mayer. Program of chamber music including Xaver Scharwenka’s Sonata for Cello and Piano, Franz Schubert’s Duo for Violin and Piano, Robert Schumann’s monumental Piano Trio in D minor, and vocal music by Richard Strauss. Two choirs, international soloists and enlarged orchestra join conductor Keith Clark in memory of lifelong Astoria arts advocate Michael Foster. Program includes the Festival Debut of Italian violin virtuoso Roberto Cani, prizewinner in the Genoa International Paganini Competition. What a concert! Three conductors lead Russian masterpieces by Glinka, Tchaikovsky and Stravinsky, plus the Oregon Premiere of Philip Glass’ Icarus At The Edge Of Time, a multi-media extravaganza combining large orchestra, film, and narrator that transforms ancient myth into a sci-fi spectacular. Icarus at the Edge of Time is a stunning orchestral work with animated film and live narration that tells a mesmerizing musical tale of space, time and a journey to the very edge of understanding—composed by Philip Glass, based on the award-winning book by physicist Brian Greene, adapted by Greene and David Henry Hwang, film created and directed by Al + Al. Debussy giggles at Tristan and Isolde’s overwrought love-death with a Cakewalk. Liszt probes the depths of Das Rheingold. Program includes Wagner’s beautiful Wesendonck Lieder sung by Metropolitan Opera soprano Deborah Mayer, plus music by Faure, Chabrier, and a chamber transcription of the Tristan Prelude by Portland composer Jeff Winslow. A rare recital by one of America’s foremost baritones, Richard Zeller and one of the leading classical guitarists of his generation, Aaron Larget-Caplan in the intimate setting of Astoria’s Performing Arts Center. Program includes Art Songs and guitar solos by Franz Schubert, Manuel De Falla, J.S. Bach, John Cage. Baritone Richard Zeller is internationally acclaimed for his sonorous dramatic voice, compelling stage presence and outstanding musicianship. His career has included 12 seasons at the Metropolitan Opera. Noted for his “astounding technical proficiency and artistic delicacy” (Boston Musical Intelligencer), classical world guitarist Aaron Larget-Caplan is an international touring and recording artist. He has performed solo and chamber music in Russia, Europe and across the United States. In anticipation of Sunday’s Grand Finale operatic concert -- Rossini’s The Barber of Seville – Sen Incavo introduces scenes from the comedy that launched the French Revolution and inspired Rossini’s opera. Plus the Oregon premiere of Tchaikovsky’s little known Couplets for Beaumarchais’ play, and even the Looney Tunes classic The Rabbit of Seville. What’s up, Doc? Find out in this entertaining afternoon. Oregon Symphony Concertmaster Sarah Kwak returns for a night of virtuosity, Spanish flair, Hungarian Gypsy fire, and a monumental Brahms masterpiece. Semi-staged concert. Sung in Italian with English supertext. Sensational Mexican baritone Luis Ledesma as Figaro heads a world-class cast in the funniest opera of them all! Filled with soaring Bel Canto melodies, goofy jokes, and brilliant orchestral virtuosity. OSO takes Portland audiences on a journey with the Mahler 2 'Resurrection' Symphony. Saturday night, May 20, the Oregon Symphony began the weekend that wrapped up its 2016-17 season at the Schnitz with Mahler's grandiose Symphony No. 2 in C Minor, the 'Resurrection' Symphony. It featured soloists Tamara Wilson, soprano, and Elizabeth DeShong, mezzo-soprano, as well as the Portland State University Choirs. With Maestro Kalmar conducting, this was an amazing journey. The orchestra was on fire, suitably sensitive to the incredible range of dynamic contrasts and varying timbres required to make this work a success. Right from the start, the orchestra exuded a feeling of intense focus, one that drew the listener immediately. There was a peripatetic feel to the movement, with the extended crescendo that built from the lower strings wringing every bit of tension possible. The whispering tremolando from the strings was exciting to hear. The group handled the emotional displacement to more pastoral themes deftly, and the almost hypnotic shift into a dreamy brass-world was beautifully organic and completely convincing. The orchestra consistently displayed clarity and succinctness in the multiple and vital pianissimos. The more folksy portions were engaging and somewhat disjointed from the weightiness of the overall work--exactly as felt right. There were many gradual and protracted crescendi throughout the work that ended in a titanic fortissmo, and these the orchestra played well by and large. The only sour spot was in the high woodwinds, flutes and piccolos, that often did not agree on a pitch when the ultimate dynamic was reached, and these moments stood out a number of times. The vocal portions of the symphony were all spectacular. DeShong displayed a magnificent, show-stopping low alto register, and the Portland State University choirs (PSU Chamber Choir, PSU Man Choir and PSU Vox Vemina) were dignified and solemn, singing with reverence and clear diction. All in all, despite the seriousness of the work, the performers were clearly having fun, and with this composition, how could they not? 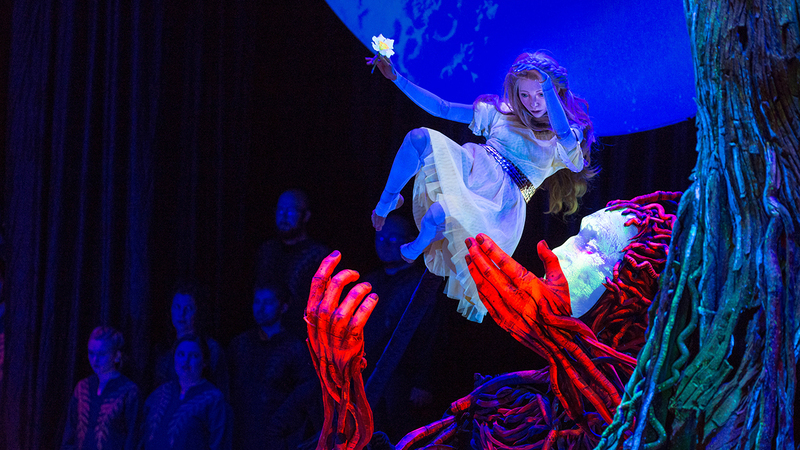 Stunning production by Michael Curry breathes new life into "Persephone"
The Oregon Symphony and puppeteer-production designer Michael Curry blew away a standing-room-only audience with a breathtaking, magical performance of Stravinsky’s “Persephone.” This rarely performed melodrama came to life via sophisticated lighting, puppetry, and evocative sets not to mention the dance, spoken monologue, and music created by the orchestra, adult chorus, children’s chorus, and tenor soloist. Curry’s visual imagery and skillful direction of twelve black-clad puppeteers absolutely enhanced the story-telling and the music to make “Persephone” a very memorable event. Curry has been acclaimed for his work with Disney’s “The Lion King” as well as for his collaborations with Cirque du Soleil , The Metropolitan Opera, London’s Royal National Theatre, the International Olympic Committee. The production of “Persephone” marked his first collaboration with a symphony orchestra, and it became the third installment in the Oregon Symphony’s unique “Sight and Sound” series. The audience knew right away that it was in for something special, because a specially-built stage behind the orchestra featured a very large moon-like disc centered between two large gnarly trees with intertwined roots. André Gide, the Nobel Prize winning poet wrote the libretto for “Persephone,” which retells an ancient Greek myth that explains the seasons of the year. However, Gide changed the story to give Persephone a Christ-like character. In the original, Persephone is abducted by Pluto and brought to Hades, but in Gide’s retelling, Persephone has compassion for the people of the underworld and goes there to provide some sense of happiness. She can do this because she is the daughter of Demeter, the goddess of harvest and agriculture. Unfortunately, Demeter really misses her daughter. This causes the earth to be dominated by the cold, harsh winter so that no crops can grow and everyone above ground is miserable. So Persephone returns to the earth and accepts Triptolemus, the tiller of soil, as her husband, but because of her obligations to Pluto, she returns to hades for half of the year. Although "Persephone" dominated the evening, the concert began with an impeccable performance of Tchaikovsky's Symphony No. 2 ("Little Russian"). The woody sound of the clarinets, the immaculate exchange of pizzicato lines between the strings, the big brass chorale, and the lovely melodic passages were augmented by the sensitive playing of Joseph Berger on the French horn and Carin Miller Packwood on the bassoon. In Curry’s production, the character of Persephone was split three-ways: as a life-size marionette, a dancer (Anna Marra), and as an actress (Pauline Cheviller). This may have caused some confusion initially, but it became clear as the story progressed. Marra’s graceful aerial dance at the end of a large boom was spectacular, doing cartwheels in slow motion above the stage and over the orchestra – briefly dangled above the timpani and trumpets. At times, her movements were accompanied by the ghostly spirits of the underworld and she also dallied with Pluto, which was represented by a fibrous 14-foot tall puppet. Cheviller deftly conveyed the text with emotion, reaching a high point when Persephone became distraught as her mother search fruitlessly for her. In the role of the priest Eumolpus, tenor Paul Groves narrated each scene with a stentorian recitative. The Portland State Chamber Choir (expertly prepared by Ethan Sperry) and the Pacific Youth Choir (expertly prepared by Mia Hall) conquered the challenging music with panache. Cheviller, Groves, and all of the singers were amplified, which was a necessity due to the Schnitz’s poor acoustic. Stravinsky’s music sounded ancient and modern at the same time, and the orchestra, guided by Carlos Kalmar, handled all of it terrifically. The musicians were positioned on a stage that extended over the first few rows of the hall. Among the many wonderful moments of Curry’s production was a stag that transported Persephone to the underworld and later brought in a pomegranate that she ate and made her long to return home. A group of women whose braided hair extended from the roots of the tree was also very striking as were the images projected on the moon-like disc. Representatives from other orchestras were in attendance to watch the show. Seattle Symphony has Curry’s production of “Persephone” already scheduled for next April. The magical vision of Curry makes me wonder what he would do with Wagner’s “Ring Cycle.” Hmmm….. The Portland Youth Philharmonic concluded its 93rd season with a concert that more than demonstrated the orchestra’s continuing high level of achievement. The colorful and meaty program featured Edward Elgar’s Cello Concerto, a symphony by Antonín Dvořák, and the world premiere of an electro-acoustic piece by American composer Debra Kaye. Each selection was performed outstandingly with incisive commitment by the orchestra under the baton of its music director David Hattner. Elgar’s Cello Concerto put the spotlight on Annie Zhang, who won the orchestra’s annual concerto contest. Although only a high school freshman, Zhang showed stellar technique and artistic talent that made music sing from her cello. She fearlessly dug into the very exposed opening statement, quickly establishing the melancholic and soulful mood of piece. Whether plunging into the lowest register of her instrument or the highest, she held nothing back throughout each of the four movments. Her passionate playing, wonderfully accompanied by her orchestral colleagues, gave Elgar’s music depth and an immediacy that resonated throughout the hall. The orchestra gave a scintillating performance of Dvořák’s Symphony No. 8, excelling with dynamic phrasing yet never losing sight of the music’s Slavic nature. Particularly rich and strong were the melodic passages delivered by the cello section, which had 16 members. Exchanges by woodwinds and brass went smoothly and the trumpet fanfare in the fourth movement was executed exceptionally well. The violins played impeccably, including some solos by concertmaster Fumika Mizuno. Several principals played their solo passages and duets very well, and the entire ensemble put a polished and glorious stamp on the finale. The concert began “Ikarus Among the Stars,” a new work by American composer Debra Kaye in honor of Benjamin Klatchko, a PYP violist whose life was cut short at the age of 17. Inspired by the music and life of Klatchko , Kaye, who teaches at the Mannes School of Music, created a one-movement piece that blended recorded segments of Klatcho’s techno-pop music into the orchestral fabric. The piece began with a somber viola solo that transitioned to a lighter segment involving the entire orchestra. The brass, woodwind, and string sections exchanged the leading line deftly and all was merged with electronic music that had a pronounced rhythmic drive. The combo seemed to launch the orchestra into a more energetic gear, which was then interrupted by another recording, this time with vocals. Two more exchanges between the orchestra and recorded passages seemed suggest that one inspired the other until it all ended at a higher, grander elevation –alluding to the ancient legend of Ikarus. It seemed like the graduating class of musicians – marked by wearing a rose boutonniere – was very large. It looked as if almost all of the woodwinds will be leaving. Fortunately, the PYP organization will have a new crop of talented young musicians rising through its ranks. With Hattner in charge, the orchestra is in excellent hands going forward. The musicians of Northwest Art Song may usually -- appropriately, given their name and stated mission -- stick to the chamber song repertoire, but this year, they'll be closing their season with something a little different. May 2017 marks the 450th birthday of Claudio Monteverdi, who is arguably one of the most innovative composers in all music history, and these stellar singers will be marking the occasion with a birthday celebration! So how did this concert come about? Northwest Art Song co-Artistic Director Arwen Myers, along with a collection of some of Portland's finest vocalists, sang a handful of Monteverdi's Book IV madrigals on 45th Parallel's Voice of Innovation this spring, and the need to present more of Monteverdi's music in Portland became obvious. After hearing an enormous amount of positive feedback about the madrigals from the both the audience and her fellow singers following that concert, she decided to mount an extra project this season to celebrate his incredible work. And how does Monteverdi's music fit into the art song world? Although it's certainly not "art song," Myers doesn't think it's too much of a stretch. "While Monteverdi's madrigals are certainly not art song in the traditional sense," she says, "it's quite a natural fit for us. His text setting, or the way he expresses the meaning of the text in the music, is second to none, and the emotional content of both the words and the music is incredibly poignant. These pieces may not technically be art songs, but they exhibit so many of the things that make art song the incredible genre it is." The concert will feature a collection of some of the finest vocalists in the Portland scene -- Arwen Myers, along with her fellow NWAS Artistic Director Laura Beckel Thoreson, will join with soprano Catherine van der Salm, mezzo soprano Emily Lay, tenor Chris Engbretson, and bass Aaron Cain. They will be joined by Seattle theorist John Lenti, who is a consummate musician often heard with Portland Baroque Orchestra and other early music ensembles in Portland and around the world. The program will focus on Monteverdi's madrigals from Book IV onward; we these mid- to late-career pieces best showcase his wholly unique compositional voice, in their sheer brilliance, are sure to excite and energize a wide Portland audience. The audience is invited to join the performers for a reception following the concert... and rumor has it that there may be birthday cake. Northwest Art Song performs Monteverdi 450, Wednesday, May 17, at 7:30 p.m. at the Old Church Concert Hall. $5-20 advance, $5-$25 door. Available at http://www. brownpapertickets.com/event/ 2903940. There’s nothing like young artists portraying young artists and that was one of the most appealing aspects of Portland Opera’s production of Puccini’s “La Bohème” on opening night (May 5) at Keller Auditorium. The cast of young professionals thoroughly embraced their roles as impoverished yet carefree denizens of the Latin Quarter of early Nineteenth Century Paris. That included impressive singing by Italian tenor Giordano Lucà, who made his American operatic debut as the poet Rodolfo, and American soprano Vanessa Isiguen as the seamstress Mimi. Directed by Kathleen Belcher, a longtime member of the directing staff at the Metropolitan Opera, the entire ensemble worked well together to create a straightforward and lively retelling of one of the most popular operas in the repertoire. Lucà filled the house with his refulgent voice. His singing of “Che gelida manima” was a highlight of the evening and elicited thunderous applause. Isiguen poured out the soul of Mimi with a warm, rich soprano. Her “Si, Mi chiamano Mimi” was touching and heartfelt and also drew ecstatic applause. Yet, in spite of their delicious voices, Lucà and Isiguen didn’t quite mesh convincingly as passionate lovers. Will Liverman was thoroughly convincing as the hot-headed painter Marcello and Jennifer Forni had a field day as Marcello’s impulsive, mercurial lover Musetta. Forni’s enticing, show-stopping performance of “Musetta’s Waltz” was another highlight of the production. Rodolfo and his roommates had a great time with the light-hearted scenes, clowning around with an excellent sense of comic timing. Ryan Thorn’s animated Schaunard added an extra level of energy that was athletic at times. Christian Zaremba fashioned a good-natured Colline, and his somber farewell to his old coat (“Vecchia zimmarra”) elicited a warm response from the audience. Deac Guidi excelled in the role of the Benoit, turning him from a crotchety landlord into a lovable and laughable buffoon. Damien Geter created a clueless and infatuated Alcindoro. Aaron Short spread a bright layer of joy as Parpignol, the toy vendor. Gregory Brumfield as the Custom House Officer and Anders Tobiason as the Sergeant showed the requisite gruffness for their characters. Effective lighting by York Kennedy accented the huge painted backdrops provided by Seattle Opera evoked the Paris of the Nineteenth Century. They were complimented well by traditional costumes that were designed by Susan Memmott Allred for the Utah Symphony and Opera. The street scene in front of Café Momus offered a swirl of colorful activity with the Portland Opera Chorus, a charming children’s chorus, and a small marching band taking turns in the spotlight. Conductor George Manahan chose to keep the tempos brisk but was very attentive to any singer who wanted linger over a phrase. Here and there the orchestra got a tad too loud for the singers – with the exception of Liverman whose expressive and resilient baritone was stellar throughout the performance. Attendance at the Keller seemed to be a little down, which was dismaying since “La Bohème” is one of the best-loved operas ever written. Perhaps word about the fine singing will inspire more to come hear the final two performances on May 11 and 13. On this day in 1874, the American premiere of J.S. Bach's "St. Matthew Passion" took place at the Music Hall in Boston by the Handel and Haydn Society with Carl Zerrahn conducting. The performing forces included a chorus of 600, and orchestra of 90, and a 60-voice boy's choir. For this performance, the first 12 numbers of Part II were omitted. The complete Passion was not performed by the Society until 1879. About half of Bach's Passion was given its New York City premiere at St. George's Church on March 17, 1880, by the New York Oratorio Society under Leopold Damrosch. Theodore Thomas conducted the next documented performance in Cincinnati on May 17, 1882, during that city's May Festival. Last December and January, I wrote an article for Early Music America magazine about the Berwick Academy, which puts the finishing touches on young professionals bound for the historical performance arena. The three-week institute's faculty offers Monica Huggett, Rachel Podger, Debra Nagy, and other eminent artists. All of the students receive a fellowship to participate in the academy. One of the students that I interviewed is violist Kim Mai Nguyen who now plays with the Portland Baroque Orchestra and is a member of the Oregon Symphony. The Berwick Academy is part of the Oregon Bach Festival, and in fall, it will have its own recital hall in a new building that will also house the OBF offices. My article is fairly substantial - 2,000 words, and the editor put it on the cover. So, I took a photo of it on my laptop. On this day in 1936, Prokofiev: "Peter and the Wolf" received its premiere at a children's concert by the Moscow Philharmonic, conducted by the composer.